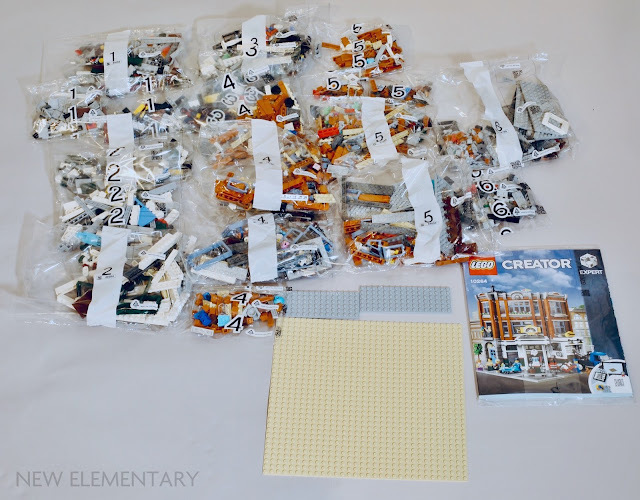 On opening the box there is one 230 page instruction booklet, a Brick Yellow [TLG]/ Tan [BL] 32x32 Baseplate (Element ID 4558611), two loose Medium Stone Grey [TLG]/ Light Bluish Gray [BL] Plate 16x6 (Element ID 4211733 | Design ID 3027) and a lot of bags numbered 1-6... and NO STICKERS! There are two new elements with completely new moulds in the set. 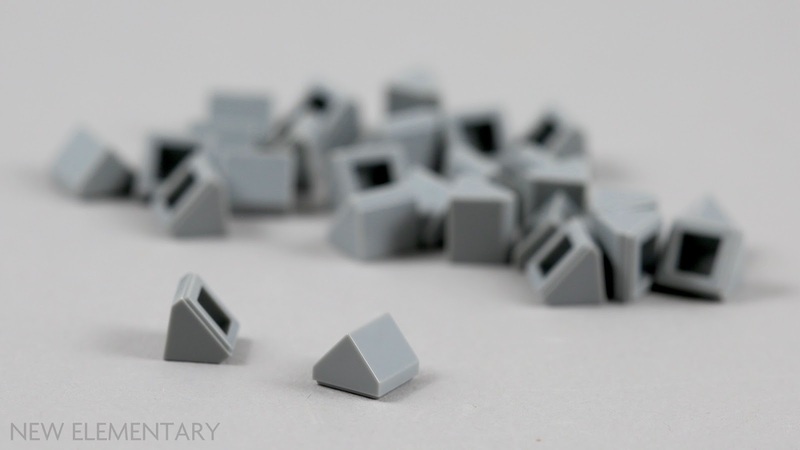 Here at New Elementary we had been calling this first element "Minecraft feet" as we noticed it in the 2019 Minecraft sets, so I was surprised when I noticed a Tile 2x2 with 1x2 Vertical Plate in Dark Stone Grey [TLG]/ Dark Bluish Gray [BL] (Element ID 6250018 | Design ID 41682) within Bag 1. As you can see, the base of the element is a 2x2 tile while the position of the 1x2 portion is central, with two plate widths each side. It is used within Jo's Rescue Tow Truck and we will take a closer look at this in the next post. EDIT - There is actually a second new element that slipped under my radar at first - thanks to all who pointed it out! White Turntable 2x2 Female (Element ID 6238334 | Design ID 27448) is a new mould that is not used in a particularly interesting nor essential way in this set but I think we will see more of this smaller turntable in sets with the new 'splat' gears that have been appearing in some of the 2019 set images. Now that the two completely new elements are out of the way, let's start at the bottom and take a look through the model. On the ground level there’s a 1950s-style gas station with fuel pump, kiosk and a vehicle workshop complete with a roll-up door, vehicle lift and tire mounter. 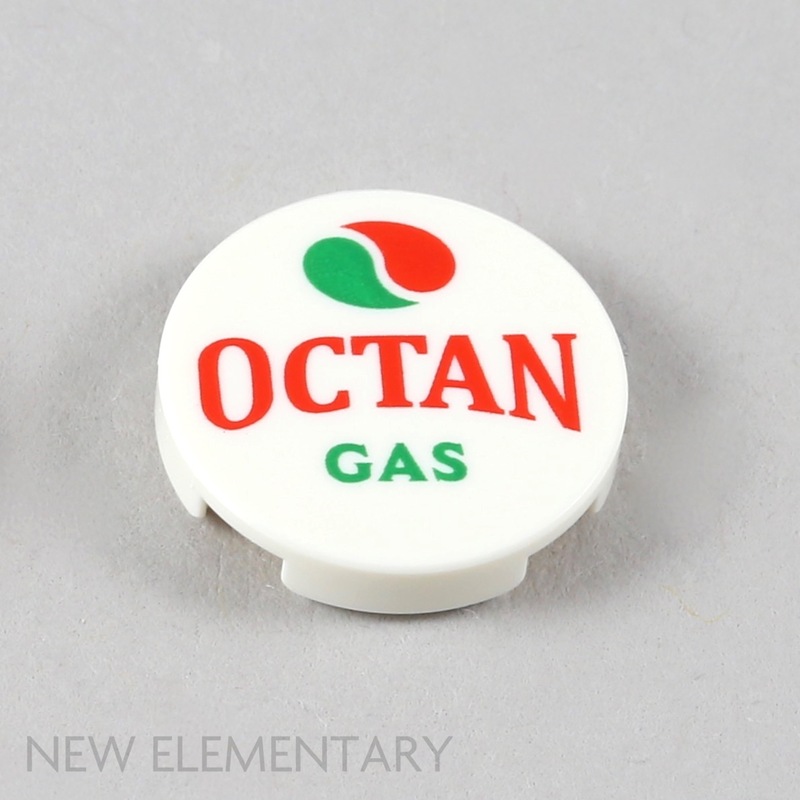 There are new decorated elements to be seen, firstly the Octan Gas sign on the pump. There are two Flat Tile 2X2, Round 'Octan Gas' (Element ID 6254067) that are connected with a Ø3.2 Shaft W. Cored Knob (yes that really is the name of a LEGO element) to make the sign. These are lovely printed tiles and complete the 'retro' pump perfectly. 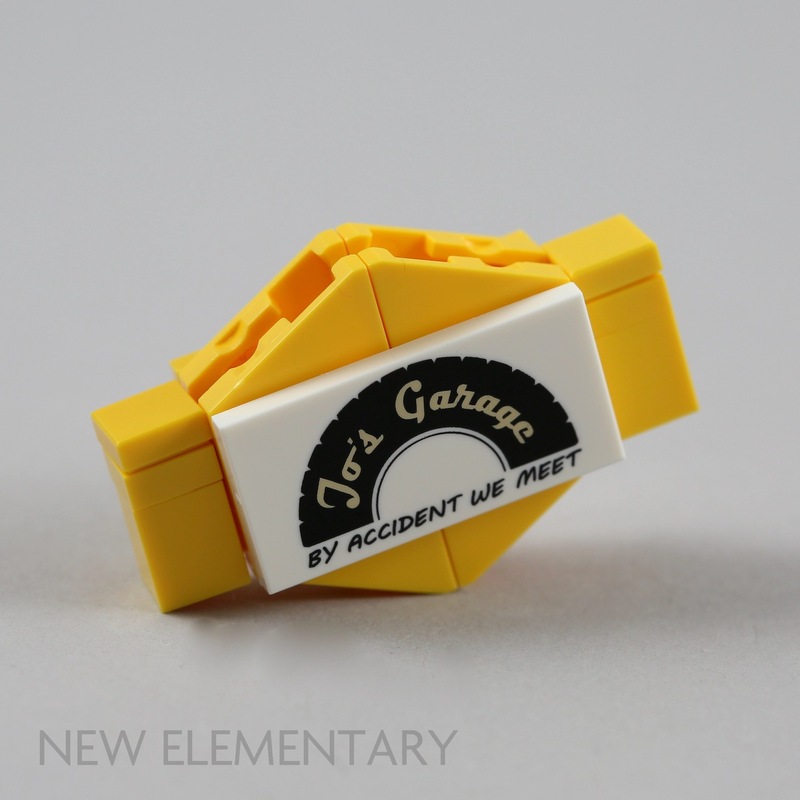 The other printed element of note is the sign White 2x2 Tile 'Jo's Garage' (Element ID 6254086). This is attached to a nice little sign built from Bright Yellow [TLG]/Yellow [BL] Plate 2X4X18° (Element ID 4260192 | Design ID 51739) and using Yellow Lamp Holder (Element ID 4632569 | Design ID 4081) as the method of attaching the two sides of the sign. I love a wee touch of LEGO humour, so a vehicle repair business with the tag-line 'BY ACCIDENT WE MEET' is spot on. 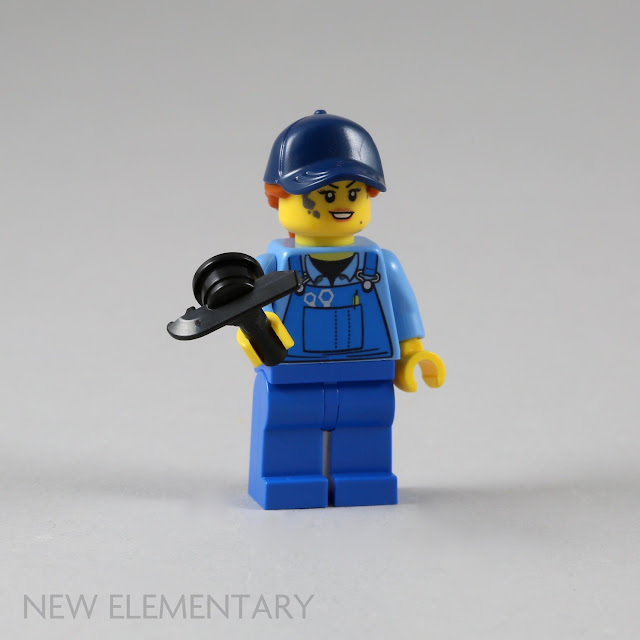 Taking a closer look at the bucket beside the gas pump also reveals Black Minifigure Skate (Element ID 6253287 | Design ID 18754) used as a squeegee to clean windscreens. This is the first recolour for this skate as it has only ever been available in Silver Metallic before. On the first floor (or second floor for our US readers) there is an animal clinic that features an examination table, parrot perch, fish tank and a waiting area with sofa, armchair, table and flowerpot, plus the animal doctor’s desk lamp, microscope, mug, newspaper, envelope, scissors and syringe. There are a host of new elements to note here, with Dark Orange and Sand Blue featuring heavily. The Sand Blue Windscreen Frame 2X6X2 (Element ID 6253475 | Design ID 13760) used to create the bay window is a new colour for this element. In addition, Frame 1X2X3 (Element ID 6253441 | Design ID 60593) also appears for the first time in Sand Blue. 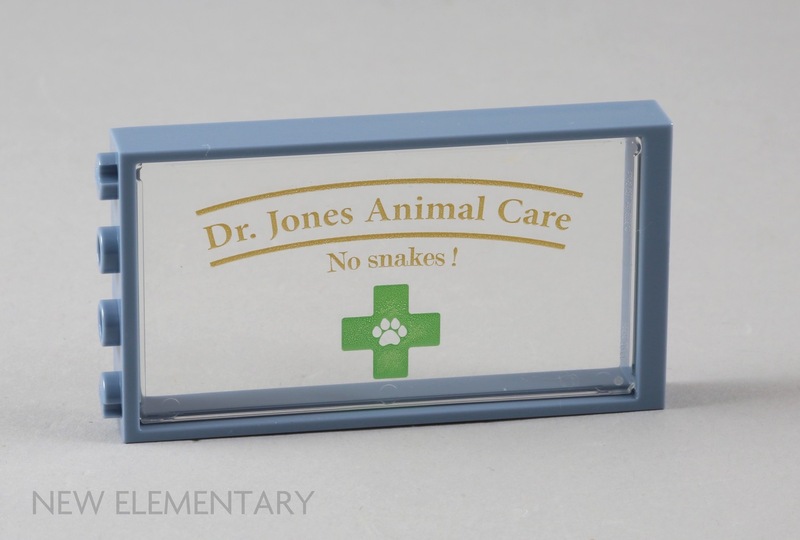 There is also a printed Transparent Glass for Frame 1X4X6 (Element ID 6257551) advertising Dr. Jones Animal Care, a nod to Indiana Jones I think. The SNOT area used to create the window complex above contains Plate 1X1, w/ 1.5 Plate 1X1, Downwards in Earth Blue [TLG]/Dark Blue [BL] (Element ID 6254479 | Design ID 36841) for the first time. There is also a recolour used for the seating on this floor, White Brick 1X2, Outside Half Bow (Element ID 6248827 | Design ID 37352) joins the only other colour of this element at present, Medium Stone Grey. I'll say more about the seating it is used for in the next post. 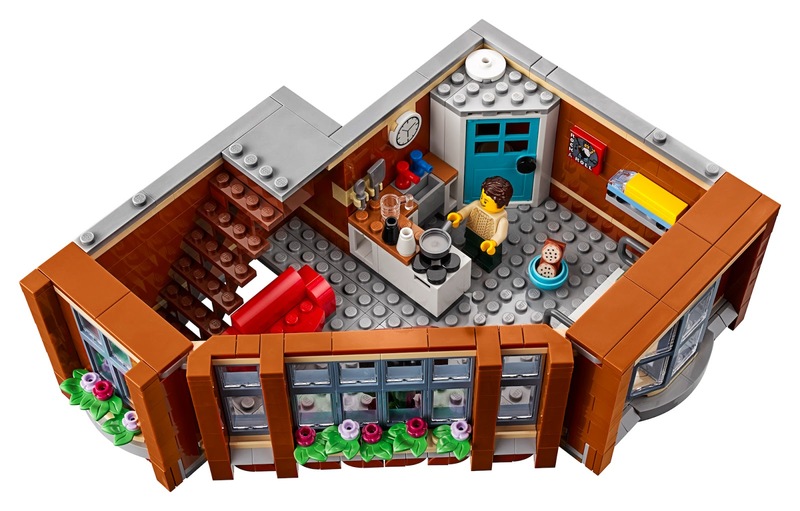 The second floor apartment features a well-equipped kitchen with cookies baking in the oven, sink, pan, mug, salt and pepper, spoon and spatula, plus a sofa, bed, an old-fashioned TV, and a bathroom with toilet. 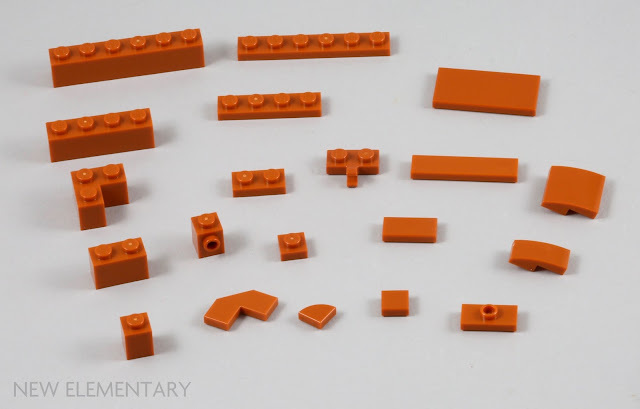 As you can see there are a lot of Dark Orange elements in the set which includes a new arrival, there are four Dark Orange Tile 2X2, Deg. 90, w/ deg. 45 cut (Element ID 6253425 | Design ID 27263) appearing for the first time in this colour. There is also a welcome return from abeyance other Dark Orange elements, including Plate 1x6 (Element ID 6253418 | Design ID 3666) last seen in 2011, Brick 1x6 (Element ID 6000743 | Design ID 3009) last seen in 2016 and Brick Corner 1X2X2 (Element ID 6253417 | Design ID 2357) last seen in 2005. Looking at the front of both the first and second floors reveals Roof Tile 1X1, Deg. 45, w/o Knobs in Medium Stone Grey (Element ID 6253436 | Design ID 35464) for the first time. 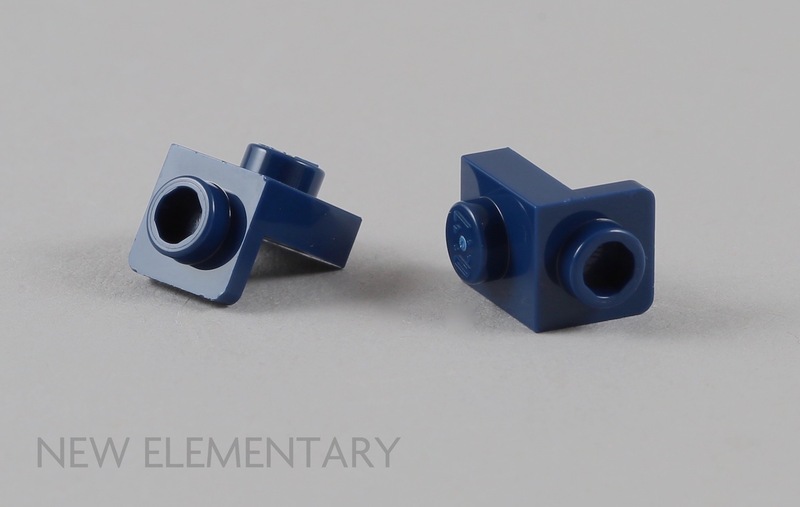 There are 80 of this element in the set so it is great to have so many of a new element in a single set. The roof top terrace features a sun lounger, parasol and flower garden. 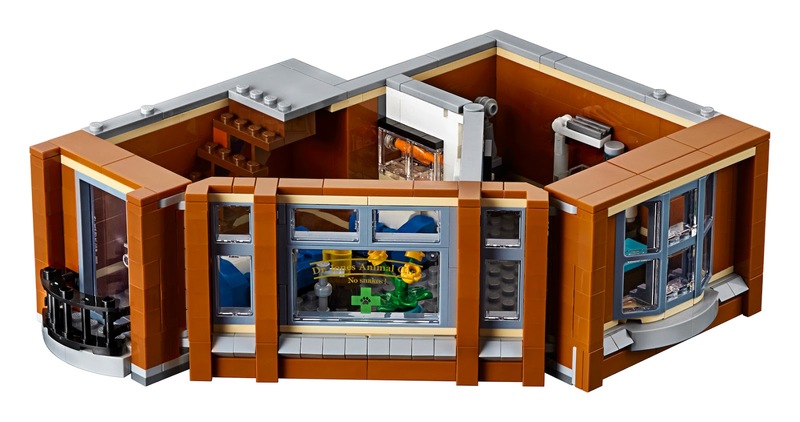 From this angle you can just see the roof access, which I thought was a new frame element but it turns out White Frame 3X4X3 Slanting (Element ID 4536519) is just not seen very often, it's in 12 sets including a previous modular. The roof top's decorative façade also uses Dark Orange 1/4 Circle Tile 1X1 (Element ID 6228968 | Design ID 25269) and there is a healthy supply of this element also; 52 are included. More importantly, you can now say ciao! to your friends as you ride the new Medium Azure Scooter (Element ID 6253483 | Design ID 15396). 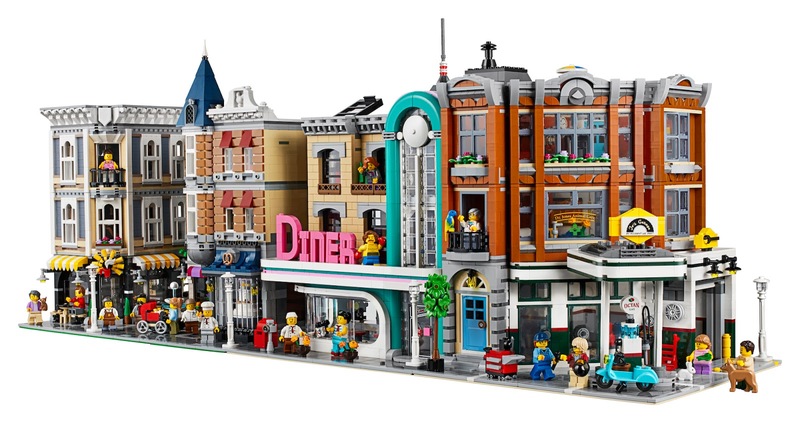 The set itself measures over 12” (32cm) high, 10” (26cm) wide and 9” (25cm) deep and fits with the other modular buildings in the series, including 10243 Parisian Restaurant, 10255 Assembly Square and 10260 Downtown Diner. It will be available for purchase from 1st January 2019 at LEGO stores and LEGO.com priced US $199.99/ CA $269.99/ UK £159.99 /FR 189.99€*/ DK 1,499DKK/ AU 299.99. 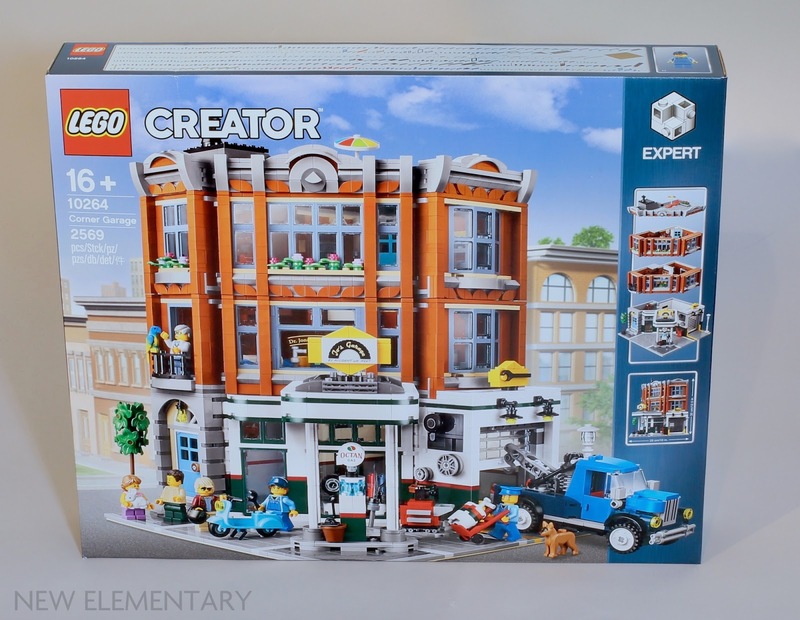 We will be taking a closer look at some of the building techniques found in the set in the next post. 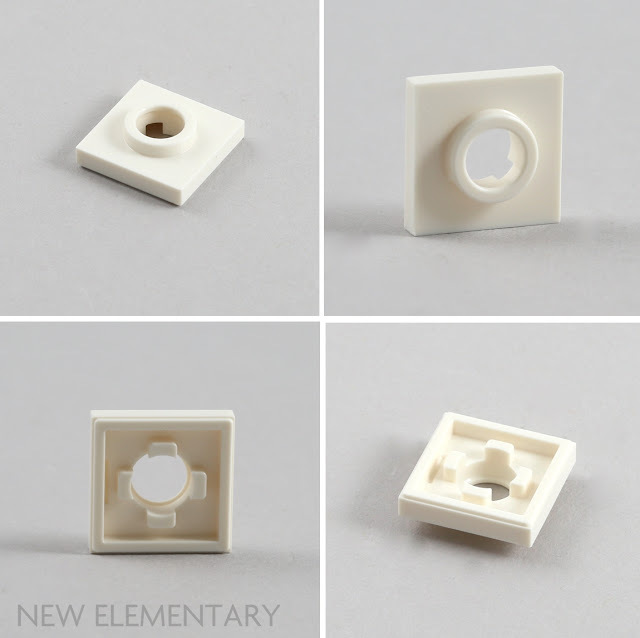 In the official image with all the new pieces, there's a white square piece that seems to be a 1x1 plate with hollow stud. Is it correct? Where is it used? Don't you think that is a 1x1 bracket? 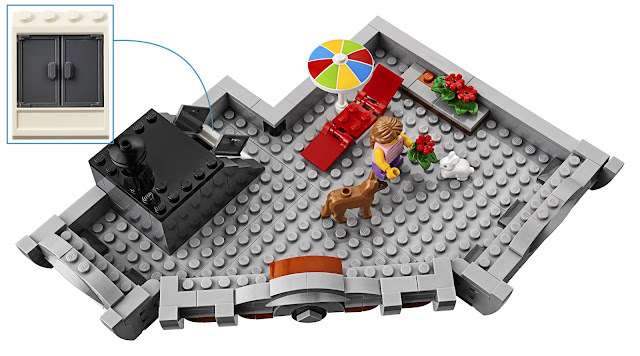 Via the brickset forums, it looks like a "turntable 2x2, female". The part that Neil linked to via Brickset is not in this set - I just double checked the instructions. An octagonal shape inside the hollow stud, rather than perfectly round. The mystery continues, I would say. 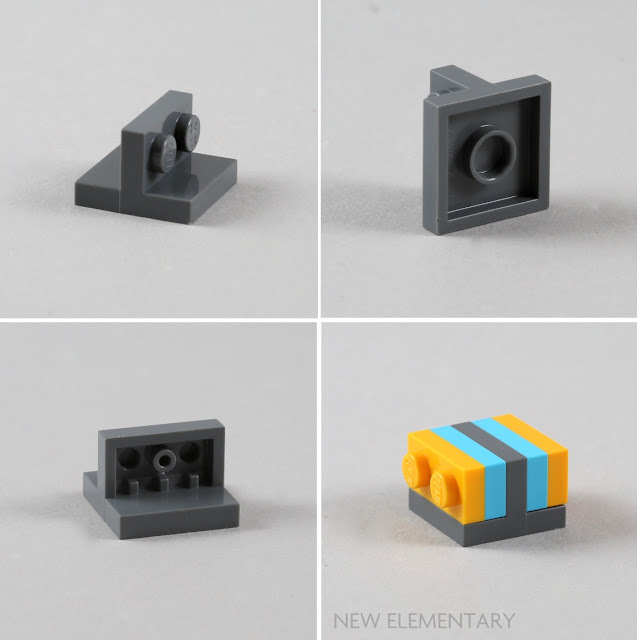 Brickset's review of the set features the turntable bottom piece, so it's curious that New Elementary's copy of the set somehow lacks it. 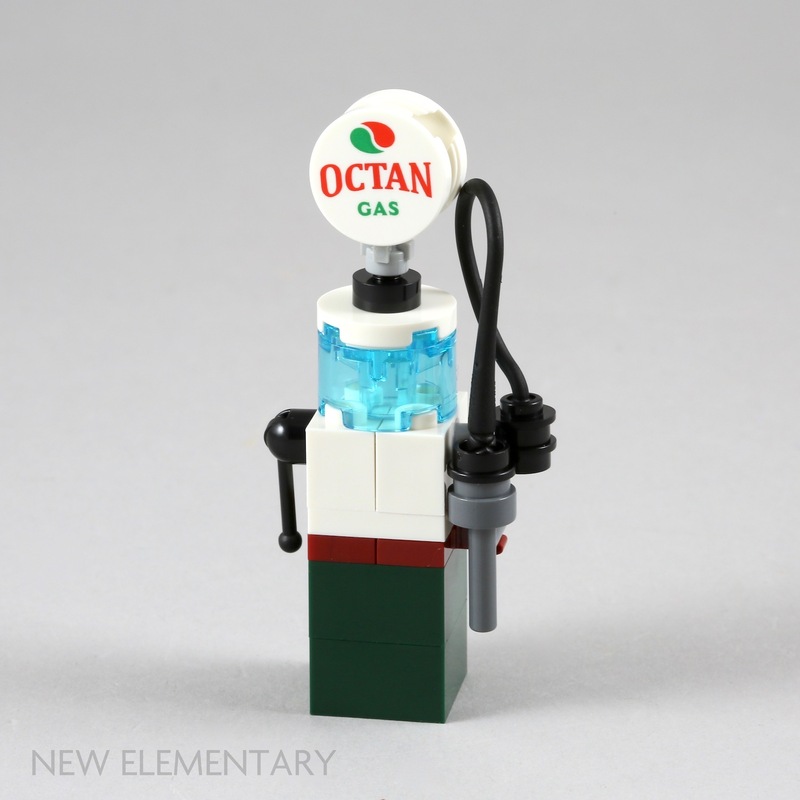 How is the corner gas pump attached to the base in New Elementary's set if it lacks this turntable part? What makes you say 1950's? The gas pump and tow truck have more of a 30's look to me. 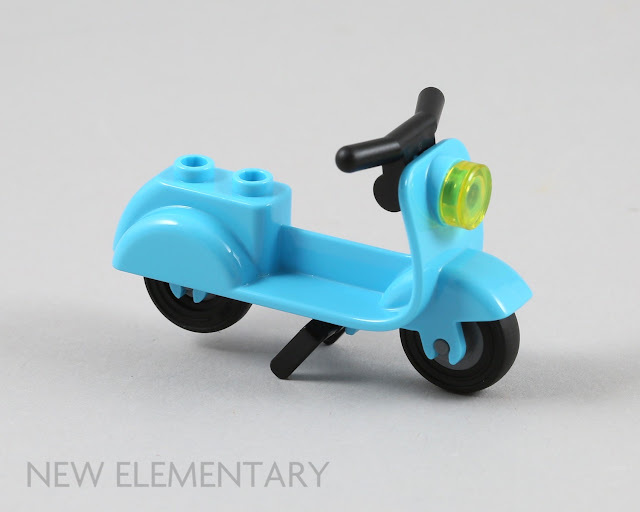 I just realized the 1950's bit came from Lego's description. Huh. The TV has more of a 30s/40s look, too. 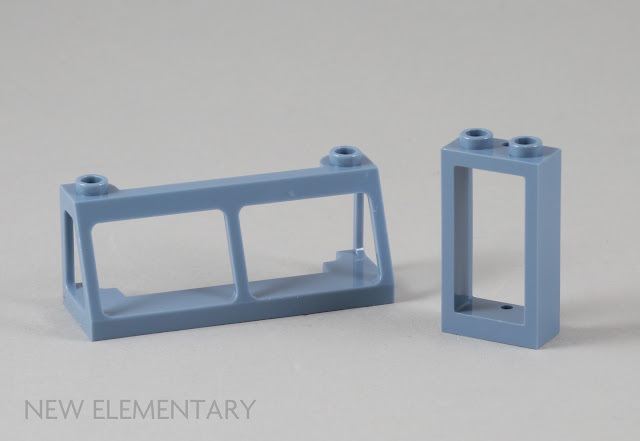 "The Sand Blue Windscreen Frame 2X6X2 (Element ID 6253475 | Design ID 17454) used to create the bay window is a new colour for this element." I think you meant Design ID 13760 (not sure about the element ID). And the 2x2 with not standard hole? More that 32 of the 1/4 circle tile in the set... more than that in front of box photo. What is a 'splat gear'? Can you give an example? Thanks! 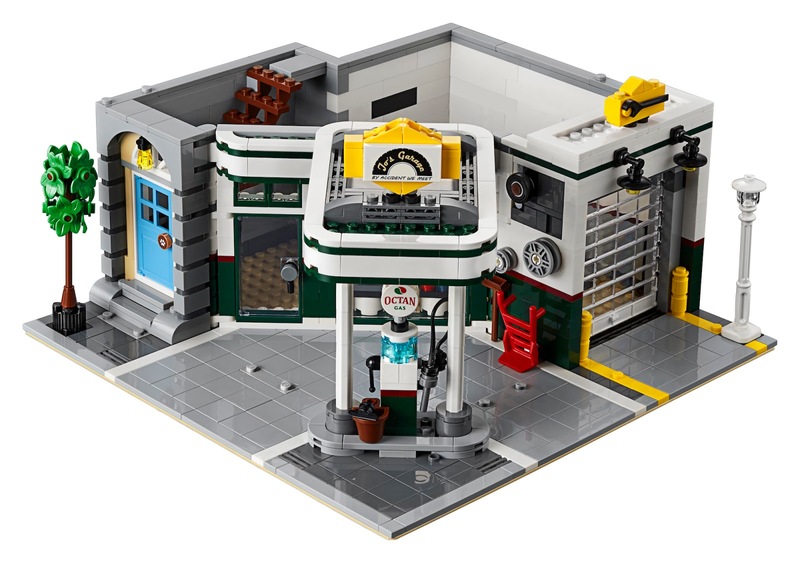 You can see the "splat gears" on the reverse image of https://brickset.com/sets/41366-1 Specifically you can see a purple one sat on one of the new 2x2 turntables in that image. 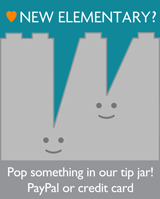 I agree, it is a very exciting new element that New Elementary will be taking a closer look at soon! LEGO call this new part the PLATE 1x2 W VERT TUBE. 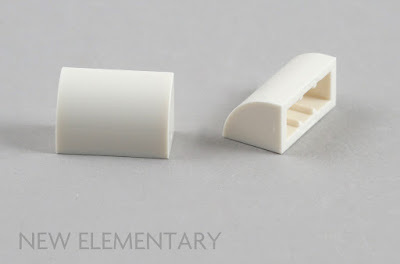 This implies that the 1x2 plate is the main family, with the tile (why called tube?) the add on. TLG are terrible at naming parts! Well I guess it does have a tube (The circle on the underside of the tile section) but it's doubly confusing to refer to the tube as vertical given that it points horizontally in this scenario!